U.S. Soccer Has A New President, But Many Question If It Represents A New Path : The Two-Way The governing body has been in turmoil since the U.S. men's team failed to qualify for this year's World Cup finals for the first time since 1986. Carlos Cordeiro, vice president of U.S. soccer, watches warmups from the team bench ahead of the start of the U.S.'s final World Cup qualifying match against Trinidad and Tobago at Ato Boldon Stadium in Couva, Trinidad, in October. 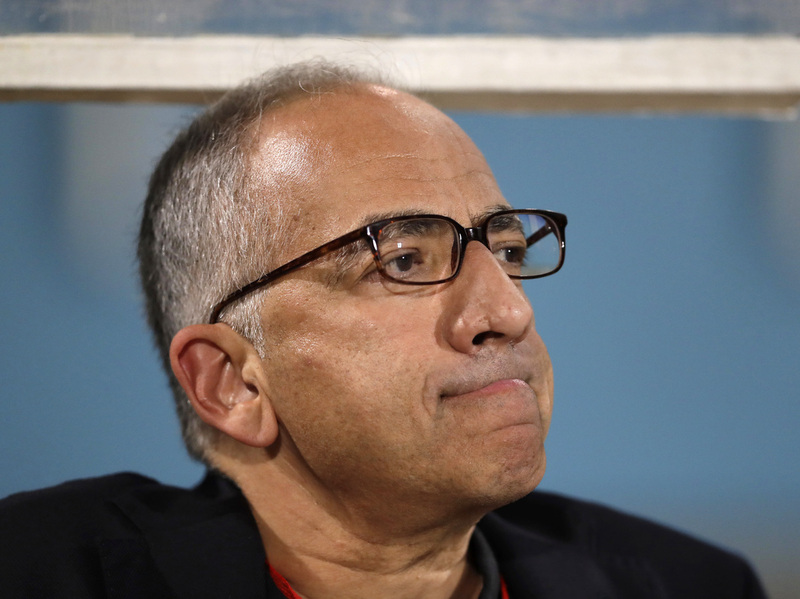 Carlos Cordeiro is the new president of the U.S. Soccer Federation, succeeding his boss, Sunil Gulati, in a final vote over the weekend that concluded a contentious race. Gulati, who has served as head of the organization since 2006, declined to run for reelection after the U.S. men's national team failed to qualify this year for the World Cup for the first time since 1986. Gulati also steps down amid multiple lawsuits between U.S. Soccer — the sport's official governing body in the U.S. — and the North American Soccer League. The suits are explained here. There's also considerable frustration that one of the most promising young players in the U.S., Jonathan Gonzalez, decided recently to sign with Mexico. Soccerwire.com writes of the vote that it "capped some three days of lobbying and intrigue at the federation's annual general meeting, where hundreds of delegates from all segments of American soccer gathered." But, as ESPN reports, "The win for Cordeiro, whose role as president is effective immediately, deals a blow to those who called for changes in the sport's national governing body after the World Cup qualifying failure ..."
Ahead of the vote, two-time Olympic gold medalist Hope Solo ripped into Cordeiro as representing everything that needed to be left behind if the sport was to move forward. "For those of you who think the state of soccer today is good enough, then you should vote for more of the same," Solo said in a speech quoted by Sports Illustrated. "I was a player for 20 years, and I saw first-hand what Carlos Cordeiro's idea of change is. You cannot, as a vice president, claim you are the lone voice for change while all of this happened under your watch. And you as delegates cannot buy that," she said. "He was part of a federation that generated millions of dollars off the backs of its players, and much of it off the back of its women's players, who have been the economic engine of this federation for years, yet treated like second-class citizens." Cordeiro was among eight qualified candidates vying for the post. He's a former Goldman Sachs executive and "considered one of two business-oriented, establishment candidates...-- along with SUM president Kathy Carter — though during his campaign he called for considerable restructuring of the federation," according to ESPN. "I think we are at an inflection point in soccer history in this country," Cordeiro said following his win on Saturday. "I think we have an opportunity to really transform it into a No. 1 sport. I think the demographics favor that." Cordeiro is calling for U.S. Soccer to grow the sport at all levels, starting with "[bringing] more young people into our ranks as registered players and [to] focus on Youth Soccer less as a business and more as a way to develop talent on the field and nurture our next generation of young adults," according to his published platform. The platform also calls for "collaborating more with adult groups and recognizing that the millions of Youth Soccer players could bolster the ranks of the 250,000 adult players if we invest more in existing tournaments, support new membership drives and better link Adult Soccer programs with Youth Soccer and fans across the country." Cordeiro is expected to get to work immediately on a number of pressing issues, including hiring a new men's national team coach and putting together a combined United States-Canada-Mexico bid to host the 2026 World Cup.